Hi I’m Nicola 31 and a busy wife married to Ian and manic mother to 5 wonderful boys Thomas, Jack, Harrison, Alexander and Joseph. Our lives were turned upside down and inside out when on the 9th February 2007 the unthinkable happened and our fourth born Alexander Robert was the victim of Cot Death. 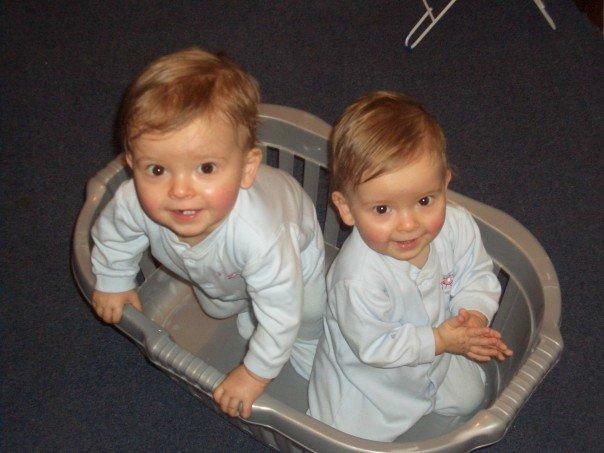 Our story starts really on the 24th September 2005 when I gave birth to Twin Boys, Harrison and the youngest by 7 minutes, they told me I had time for a cuppa after Harrison but they lied… Alexander. He was in a rush to meet us, so much so that he spent 4 days in the Special Care Baby Unit being tube fed as he was so ‘shocked’ by the birth. 8 days later we came home with our new tiny bundles and settled into a routine of feeding, changing and sleeping. Life with twins was hard but aren’t all newborns? As with all babies the pleasure and joy was overwhelming and I was immensely proud to walk anywhere with my double pushchair even though it did take me twice as long due to the admiring glances and chats with well meaning strangers, who incidentally all have a twin story. As time went on our routines settled and our boys were amazingly chilled, I have to say that they did egg each other on in most things, with Alexander being the instigator in all things naughty, you know the usual stuff like hiding the sky card, stuffing things into the DVD player, pressing buttons etc etc. Although the youngest of the two Alexander was the first to crawl about and climb the stairs showing Harrison that it was much more fun to be on the move and hide from Mummy when she wasn’t looking. Mornings for us although busy were the greatest time, before the hustle and bustle of big brothers and parents getting involved they would stand in their cots and make each other giggle by bouncing down onto their bottoms, we could hear them through the baby monitor, these are the memories I treasure. Friday 9th February was like every other morning I try and think whether there were any signs of impending doom but Ian had woken and got ready for work as normal, Harrison had been a little grizzly in the night so had ended up in with us and because Alexander’s sleep had been interrupted by him we decided to let him have a lie in! For some time after his death I hated myself for getting on with our routine, getting a shower and getting dressed all the while my baby was lying lifeless in his cot all alone. Opening the door of their room I immediately knew that something was wrong, there wasn’t the usual reaction from him when the door opened and from there I went into autopilot. I scooped him out from the cot, rang an ambulance, ushered my other boys downstairs, rang Ian who was on his way to work and then rang my parents in law all whilst attempting to resuscitate my baby. I tried to remain positive especially talking to Ian who had to make his way back up the M1 to come home, but my cheeky, full of beans little boy was gone and in my heart of hearts I knew there was nothing that could be done. We were treated fantastically by the paramedics, doctors, nurses and police, I never once felt under suspicion even though there are routines and procedures to be carried out in the event of a sudden death. This is all down to The Foundation for the Study of Infant Deaths (FSID) since 2000 they have been running a campaign for improved responses when a baby dies to ensure a thorough investigation and that the needs of the family are met in a sensitive and appropriate manner. I suppose this prevents miscarriages of justice as have happened previously. Since Alexander’s death we have had a new addition – Joseph, who is an absolute livewire and has a lot of the cheeky traits from the brother he will never meet. The work of the charity then held another dimension for us. Having Joseph was not an easy decision and I am like a cat on a hot tin roof when any of my boys are asleep but I have measures in place to give me piece of mind like respiratory alarms and a better quality baby monitor that I can hear a pin drop with. My support network is amazing and my friends and family are always there supporting me but I know also that if I needed them FSID provide a helpline and befrienders to talk to. For me however the charity’s research into cot death and why it happens is amazing, so many babies have been saved by parents following their Safe Sleeping guidelines and I hope that one day they will find a reason why these babies die. As well as the day to day life of bringing up our remaining boys we decided (when I say we I mean the ‘royal’ we) to fundraise for FSID in memory of Alexander, to give us a positive focus and keep him very much a part of the family. We have organised a Mile in Memory every year since Alexander’s death and it’s such a great way to get together and remember not only your own child, but all those that have been affected by cot death. However, I felt that there is a lot of competition for sponsorship with lots of walks and runs being held and the money that was being pledged each year was less and less. I hate to keep hounding people for their hard earned cash when times are hard so I needed to think of a ‘better’ way to get people to cough up. I came up with the idea of holding a ball when talking to a friend who had done a similar thing a few years ago, I had no idea really where to start other than trying to find a venue …and so the letter writing and emails started. I contacted lots of local hotels and out of all the letters I sent only one replied, but I believe that things happen for a reason and the hotel that agreed to help was the venue for our wedding 6 years previous and I knew it would be a blast. The planning and organising of such a huge event is time consuming but if you are willing to share your experiences with people and companies, most are happy to help in any way they can. There are a lot of no’s that come back which can be disheartening but when that yes happens there is no better sense of achievement. I sent hundreds of emails and letters to local and national companies, I posted on Twitter and Facebook requesting raffle prizes and advertising the event, and the response from everyone was heartwarming. I can’t thank everyone enough who donated something – from Manchester United for their Signed Football, Ruth Clemens (Great British Bake Off runner up) for her generous offer of hosting Afternoon Tea for 8, to bottles of wine from my husband’s work colleagues. The night itself was 8 months in planning but it is a night I won’t forget in a hurry. The ball was held on the 11th February 2011, 2 days after Alexander’s 4th anniversary and I couldn’t think of a more fitting tribute to see 200 guests dressed up in their finery celebrating the life of my little boy. Everything came together fantastically and I never dreamed it would be as big a success as it was raising over £10,000 for FSID through ticket sales, a raffle and auction plus various other small fundraisers as well. As they were leaving the guests were already asking for seats at next year’s ball! Alexander’s Charity Ball 2012 planning is now underway with Tankersley Manor , Barnsley agreeing to be our hosts once again on the 10th February. I am aiming to raise much more this time around so early organisation is essential so the begging of raffle prizes has begun. Fundrasing for FSID is the only thing I can now do for Alexander and if the money raised in his memory goes a little way to helping to stop cot death, finding a cause or giving another family like us the support they need to cope, then it is more than worth all the time and energy. Please take a look – is there some way in which you or your company could help them with the ball?